Global Travel Media » Blog Archive » JOHN ROZENTALS enjoys the bounty of John Septimus Roe’s original Swan Valley land grant. JOHN ROZENTALS enjoys the bounty of John Septimus Roe’s original Swan Valley land grant. 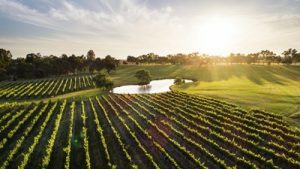 I recounted the story of Western Australia’s Western Australia’s Sandalford Wines some 10 weeks ago, about how the company had largely moved south to Margaret River in the 1970s and established some 300 hectares of vines near Wilyabrup. But Sandalford’s owners, Peter and Debra Prendiville, obviously have a soft spot too for the Swan Valley, where the whole story started in the 1830s when John Septimus Roe was granted a considerable chunk of land as reward for his work as the future state’s first Surveyor General. The latest releases from Sandalford are labelled ‘1840’, named after the year in which Roe established his winery at the Caversham estate. The 1840 label design is based on Roe’s original sketch map of the fledgling Swan River settlement, and the vines for two reds were planted in the 1960s, making them more than 50 years of age and genuine contenders for the ‘old vines’ tag. Both wines are only available in limited release and are, this scribe’s opinion, of very good quality — a triumph for the district and some splendid winemaking by Hope Metcalf. Sandalford 2016 ‘1840’ Swan Valley Cabernet Merlot ($33): Merlot was introduced into Australian winemaking in the 1970s, largely to fill the middle-palate hole that many saw endemic in local cabernet sauvignon. Here it fills that role superbly, helping create a very juicy, fleshy, savoury dry red that would pair nicely with some fine simply grilled lamb chops. Sandalford 2016 ‘1840’ Swan Valley Shiraz ($33): As usual, I prefer the shiraz to the similarly priced cabernet blend. Maybe it’s a personal preference. I lick my lips in anticipation of good shiraz but find straight cabernet sauvignon and most cabernet-dominant reds a bit austere and soulless. Enjoy these peppery, dark-fruit flavours greedily with a rare steak or a mushroom-based casserole. Windowrie 2015 Family Reserve Cabernet Sauvignon ($35): Made by Anthony D’Onise from grapes grown on vines planted more than 30 years ago by the O’Dea family near Canowindra in Central Western NSW. Despite my preference for shiraz, I like this wine a great deal for its intensity of flavour but not overly distinctive austerity. Well worth matching with some lamb backstraps smothered in red-currant jelly.